Will Over-the-Counter Hearing Aids Really Save Consumers Money? There is a recent trend to end restrictions on popular medical treatments by allowing consumers to purchase hearing aids over-the-counter without a prescription in an attempt to make it more convenient and affordable. When dealing with medical issues, however, convenience is not always the top priority. Patient experience with hearing aids is greatly improved by the service of an experienced hearing professional who can perform proper medical evaluations and hearing aid fittings. Approximately 20 percent of Americans experience some amount of hearing loss. By age 65, the rate of hearing loss reaches one in three people. Hearing aids are more common than they were decades ago, and the technology has advanced in recent years to make them lighter and more comfortable to wear. Some think the next step is to make hearing aids available over-the-counter, but there is a lot to consider in this decision. Can the average person fit and operate a hearing aid on his own? Would the wrong hearing aid further damage your hearing, instead of helping you? It may be convenient to buy your hearing aid at the drugstore, but is it safe and in your best interest? Congress is considering a bill that would make it legal to sell hearing aids in retail outlets or online. Currently, the FDA restricts the sale of hearing aid devices to health care professionals, such as audiologists, and strongly recommends a professional hearing evaluation. The new measure would bypass the doctors and let people with hearing loss go directly to the store and purchase their device. In 2016, the FDA loosened the requirement for a professional hearing evaluation to purchase a hearing aid. Adults could purchase via mail order, but children under 18 would still require a medical examination. Some viewed this change as a step toward allowing over-the-counter sales of hearing aid devices, but it did not specifically enable retail sellers. The current bill to allow over-the-counter sales of hearing aids specifies only people with “mild to moderate” hearing loss could take advantage. Determining whose hearing impairment qualifies as “mild to moderate” would be handled on the sales regulation end. Only certain models of hearing aids —intended to compensate for such perceived hearing deficiencies — would be available over-the-counter. The FDA would have to issue new regulations for labeling the over-the-counter devices. Safety and manufacturing regulations would be comparable to other over-the-counter medical devices. Currently, there are no regulations of this sort in place for consumers, because these devices are not sold directly to consumers. In its role to protect consumers, the FDA would also have to balance these new regulations with similar existing products. Consumer electronics that use similar technology to hearing aids, but are intended for consumers without hearing loss, would need to be identified and distinguished from devices intended for hearing assistance. Detractors argue that untreated hearing loss can lead to more serious conditions, and using a hearing aid does not constitute a treatment for hearing loss. 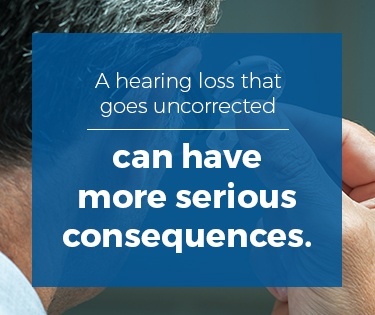 Depending on the underlying condition, serious harm can occur when a hearing aid is used to mask hearing loss that is indicative of a treatable condition. Ill-fitting and poorly maintained hearing aids can also cause damage. Hearing aids do not restore your hearing. They amplify and adjust the sounds you do hear, making them louder and easier to understand. Hearing loss can contribute to anxiety, fatigue and social embarrassment for you and the people around you. Sometimes the symptoms of hearing loss become noticeable before you realize they are related to hearing loss. Hearing loss can also be associated with dementia, especially in older people. Risk of falling — Balance and gait are complex cognitive functions most of us take for granted. When there is a hearing deficit, the available brain function to devote to these tasks is diminished. Elderly people, especially, are at a higher risk for falling when they struggle with uncorrected hearing loss. Alzheimer’s — Hearing loss associated with age can lead to Alzheimer’s, a form of dementia. Seniors with hearing loss that goes uncorrected are more likely to develop Alzheimer’s while correcting a hearing loss can prolong healthy brain function. Memory loss — Hearing loss and memory loss tend to go together. Experts believe the strain on cognitive functioning presented by hearing loss leaves fewer resources available for memory. Correcting hearing loss can preserve memory function. Heart disease — The connection between heart health and hearing is well-documented, though doctors don’t fully understand the specifics of cause and effect. Cardiovascular health maintains blood flow to the inner ear which is instrumental in hearing. A disruption in that blood flow, like from a cardiac episode, can create hearing loss. Possible signs of heart disease can be detected from the blood flow in the inner ear. Cancer treatment — Both chemotherapy and radiation can cause a degree of hearing loss, some of which may be permanent. The toxicity and trauma from these treatments may result in hearing loss that appears several years after the treatments. Diabetes — Diabetes affects blood flow and can cause damage to the inner ear. Since the inner ear is extremely sensitive and central to the hearing process, any disruption or slowing of blood flow can effect hearing. A professionally fitted hearing aid is vital for meeting complex hearing loss in demanding listening environments. Today’s hearing aid technology uses advanced digital signal processing based on decades of research from both industry professionals, doctors, and input from patients. There are several hearing aid models available with different sizes and features. The size and design of the hearing aid should be fitted to your ears, and the amount of amplification, ease of use and special features should fit your situation and lifestyle. A hearing professional is best qualified to help you find the right hearing aid model for you and be sure it fits properly. Knowing whether your discomfort is just adjusting to a new device, or if there is more to it. When you first get a hearing aid, it is going to feel strange and uncomfortable. You are not used to having anything in your ear, and you may become fatigued from hearing all the detailed sounds you were previously missing. A hearing professional can evaluate your concerns and distinguish adjustment discomfort from poor fit. Understanding all the features of your new device. Like phones, hearing aids are increasingly sophisticated. When your audiologist fits you for your new hearing aid, he or she can explain how it works and any special features you may benefit from. The audiologist is an expert in hearing and the latest devices to improve hearing quality. Modern hearing aids can adjust to adverse sound conditions by learning your listening preferences. It is like having a mini-computer in your ear, complete with directional microphone technology, algorithms for noise management, Bluetooth capabilities, feedback cancellation and built-in resistance to sweat, water and dust. Exchanging a hearing aid you can’t get used to. When a hearing professional fits your hearing aid, there is some recourse if you don’t like it. The professional’s goal is to improve your ability to perceive sound, not sell you a device. He or she can take the device back and give you some different options. Most hearing professionals will work with you to find a solution to your hearing deficit that makes you happy. At least 91 percent of patients using a hearing aid that was professionally selected, fitted and maintained for them are completely satisfied. The fitting itself is only partially dependent on the quality of the device. Two-thirds of the successful fitting relies on device selection, response programming that is customized to the patient’s lifestyle and degree of hearing loss, physically fitting the hearing aid to the patient’s unique ear anatomy and ongoing adjustments. Follow up and maintenance on a hearing aid in response to internal and external environmental changes are essential to continued satisfaction. Performing repairs and maintenance on your hearing aid. Hearing aids need to be adjusted periodically. The batteries have to be replaced and can be difficult to handle because they are so small. 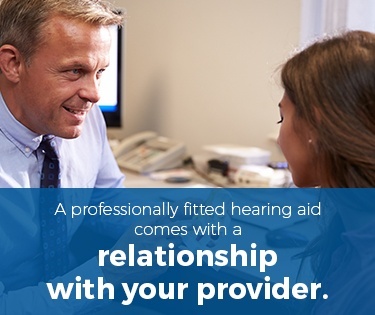 A professionally fitted hearing aid comes with a relationship with your provider. You have an expert who can change batteries and perform other maintenance and adjustments on your hearing aid when needed. Hearing aids are small, but extremely complex. To get the best outcome for your hearing loss, you want a hearing professional to fit your hearing aid and maintain it for you. The process of getting a hearing aid starts with device selection, following your hearing exam. Based on your particular type of hearing loss, your audiologist will recommend a device that is right for you. There are many choices on the market, and a hearing aid can improve most mild to moderate hearing loss. A hearing test will determine the lowest and highest pitches you can hear. The audiologist will measure the range of your hearing, which sounds are too soft for you to pick up and which ones are loud enough to hurt your ears. Using this information, the audiologist can determine which type of device you need and which hearing technology will benefit you the most. Presentation of possible devices. Your hearing professional will discuss with you the range of your hearing loss and devices that can help. Your lifestyle and personal concerns should also be part of this conversation, so you can choose a device with the most helpful features for you. Impressions of your ears. Your audiologist will insert a canal block into your ear to the second bend. This piece keeps the impression material from getting to your eardrum or sticking in the ear canal. The technician will inject the mold material into the block and allow it to set for about 10 minutes. When it is finished, the audiologist will gently remove the mold from your ear and send it to the hearing aid manufacturer. Your custom hearing aids arrive. About two weeks after your fitting appointment, your hearing aids should be ready. Your hearing professional will insert a tiny microphone into your ear before placing the hearing aid. The microphone will measure the volume of sound at your eardrum. This is how you can properly adjust the volume on your hearing aid. Once you've been properly fitted for your hearing aids, your hearing professional will review with you how to care for your hearing aids, when to take them out, how long to wear them the first several days and how to treat them when showering or swimming. If you have questions in those first few weeks with your new hearing aids, you can always call the office where you got them and ask for help. Most people wait too long before seeking a professional assessment of their hearing loss. They either don’t think it is important, or they figure nothing can be done about it. Hearing is an important sense that enhances life and social interaction. When you suffer from hearing loss, you are missing out and your quality of life diminishes. Everyone’s ears are unique, and so is each person’s hearing loss. The more severe the hearing loss, the more important it is for a professional to assess, make recommendations and ultimately execute a plan for improved hearing. Patient education and counseling are important parts of diagnosing a hearing loss, along with selecting the proper hearing aid and evaluating the type of hearing impairment. The services of a qualified hearing professional make hearing loss correction successful with hearing aids. Hearing loss can be caused by loud music, exposure to high-pitched tones or a general deterioration of nerve function associated with aging. Whatever the reason, most hearing losses can be supplemented, and should be professionally diagnosed. 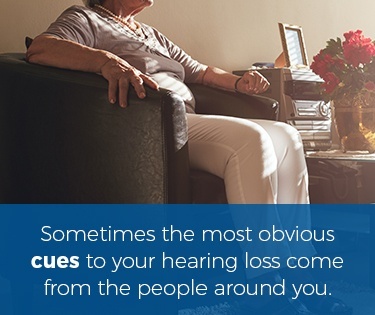 Sometimes the most obvious cues to your hearing loss come from the people around you. You may not realize you are talking loudly, but when other people complain, you should take notice. If you always ask people to repeat themselves, eventually your family and friends will start to tease you about the habit. Hearing loss may also be a reason you avoid making phone calls or shy away from certain social situations. You might notice your aggravation in these situations and not realize it’s because you can’t comfortably hear what people are saying. The proper diagnosis of hearing loss is essential to overall health, especially in children. A professional evaluation can reveal an infection or other underlying disease that requires treatment. Hearing loss due to neurological causes may be linked with larger health issues that should be addressed. Sudden hearing loss or the loss of hearing in one ear may indicate a circulatory problem. It could also be caused by immunologic or neurologic issues. Neoplastic, traumatic and toxic issues can also cause hearing loss. Without a proper evaluation, the underlying cause of your hearing loss could go untreated. A professional hearing test is simple and non-invasive. It begins with a physical exam, during which your doctor will look in your ears to see if you have excessive wax buildup or inflammation. Wax buildup can account for a certain amount of hearing loss, and can easily be cleared by your doctor. Inflammation could be a sign of infection, which also can inhibit hearing. An ear infection usually responds to antibiotics and can be fully resolved, restoring your hearing. After the physical exam, your doctor will start with a routine screening test. You will be asked to respond to a series of sounds at different levels and coming from different directions. Your doctor may ask you to cover one ear at a time to see if there is any change in your hearing ability from one ear to the other. Another sound test your doctor or hearing professional may conduct involves tuning forks, which are small metal instruments that vibrate at different frequencies to produce sounds. Your doctor will strike the tuning fork to set it vibrating, then touch the end of it to a surface, making the vibrations more audible. This test assesses damage to your middle ear’s ability to sense vibrations. Detecting nerve damage, structural damage in the middle ear or both are important parts of your hearing diagnosis. The type of hearing loss you have will determine what type of hearing aid device you need. Finally, your hearing professional will give you an audiometer test. For this test, you wear earphones and listen to tones. The audio technician plays specific frequencies at different levels and in one ear or both. You raise your hand to indicate which ear is hearing a sound. This test is used to map your hearing range and pinpoint where your deficits are. Hearing aids are sophisticated electronic devices comparable to smartphones. They address different issues of hearing loss and include various features manufacturers think customers want. The advances in this technology in recent decades are amazing. Modern hearing aids are discreet and more effective than older models. They allow people with various degrees of hearing loss to regain some of what is lost. More importantly, they let people with hearing loss function in society and their daily lives. In many cases, hearing devices extend people’s lives by improving quality of life. Buying a hearing aid wthout the benefit of a professional hearing assessment or the guidance of a hearing professional can be risky. If you choose the wrong device, it may not solve your problem. Hearing aids are expensive — even more so when you have to buy two or three before you find the right one for you. Without a hearing test, you cannot be sure a hearing aid is the solution to your problem. Hearing loss has many causes, and a hearing device isn’t always the best way to solve the problem. You could buy a hearing aid over-the-counter and end up masking a bigger health issue. Hearing is an important sense that affects all aspects of your life. You cannot safely drive your car with a measurable hearing loss. Your participation in social settings and your ability to enjoy recreational activities like watching a movie are all impaired by a hearing loss. Your hearing is too important to trust to a retailer, rather than a hearing professional. There are also a lot of things going on in your head to create your sense of hearing. Your ears are a complex network of nerves and specialized structures. Hearing perception ultimately comes from your brain and affects other things like your speech. Most people are not fully educated on the hearing process, how it works and how to supplement it properly when it isn’t working. Audiologists and other hearing professionals are specifically trained in the area of hearing. They understand nerve involvement and how the structures in your ear can affect how you hear. They know how to use the data collected from a hearing test to diagnose your hearing loss. 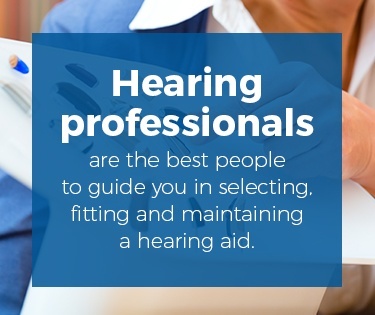 They are the best people to guide you in selecting, fitting and maintaining a hearing aid. If you suspect you have a hearing loss, do not wait to bring it to your doctor’s attention. The hearing specialists at Beltone are here to help you. We have spent years researching and developing the latest hearing aid technology, and continue to improve the devices we offer. More important is our customer service. When you come to Beltone, a hearing professional will work with you to improve your quality of life through increased perception of sounds. We can evaluate your hearing, diagnose the specific problem and custom-fit you with a hearing aid to fit your lifestyle and hearing deficit. To find out more about your hearing loss and the options available to you, take our online hearing test to see what you are missing, then schedule a consultation at one of our convenient locations. Let Beltone help you protect your health and well-being with hearing care.